Services in the church are conducted following the Liturgies found in the Book of Common Prayer. Service formats and hymn numbers are listed in the bulletin. Hymns are sung from the 1982 Hymnal. If you would like to request that you or someone be added to St. Luke’s prayer chain, please either send a note to the church or call the Parish office. Prayer requests are printed weekly in Let’s Connect or can remain confidential. Members of St. Luke’s “Dame Julian Prayer Chain” pray regularly for those listed on the prayer request list. Members of our parish are also invited to pray for those listed as the spirit leads you. Use this confidential form to submit a prayer request. Music is praise, comfort and cheer. And calm, reverence, solace and poetry. Music transcends time and place. 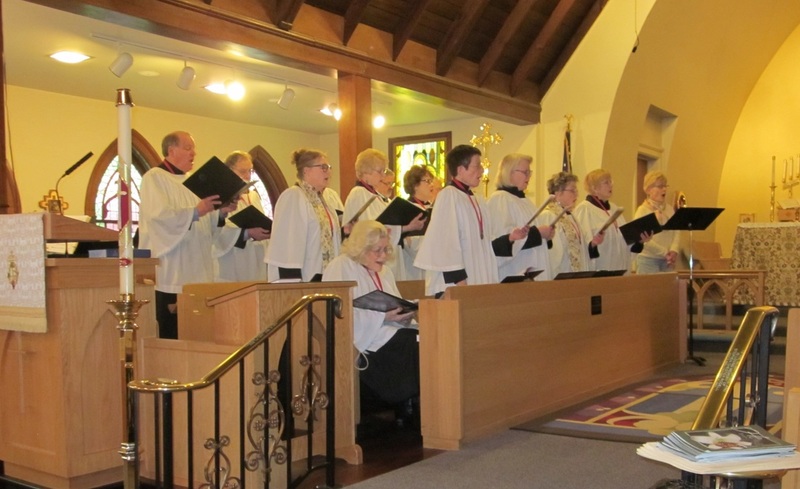 St. Luke’s Chancel Choir sings anthems from the 16th through 21st century, inspiring worship during our 10:30 service on Sunday mornings. On the first Sunday of the month, plus Christmas Eve and Easter, services are further enhanced with the unique beauty of handbell music by our Handbell Choir. 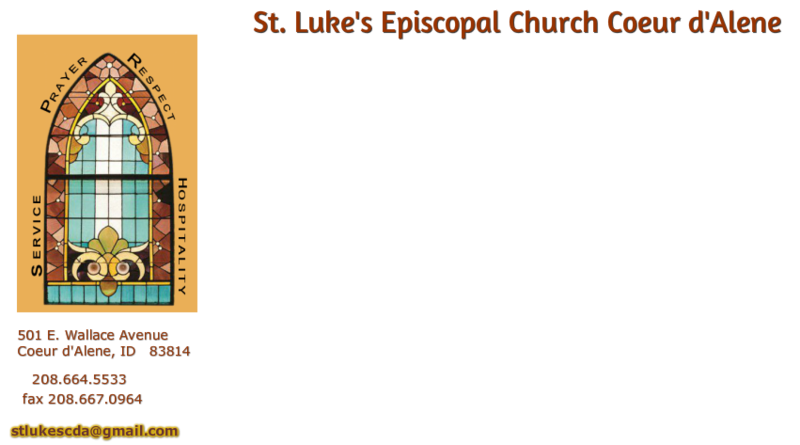 Learn About St. Luke’s Music Programs. The many dedicated members of the St. Mary’s Altar Guild share this belief as they assist the clergy and prepare St. Luke’s for all services, weddings, funerals and baptisms. Guild members also prepare the beautiful floral arrangements on the altar each Sunday (except during Lent) and for Christmas and Easter. The Guild’s passion statement: Quietly serving Christ while caring for the beauty of the Sanctuary. St. Mary’s Altar Guild is open to anyone who would like to join. We invite you to learn more. Acolytes have been a minor order since 252 CE. Acolytes are members of the worship team serving as torch bearers, lighters of candles, crucifers (acolyte carrying the cross during processions), thurifers (acolytes carrying an incense censer) and banner bearers. They also assist the deacon or priest at the preparation of the table for communion. Find out about serving. Our Lay Readers are a dedicated group who read the scripture lessons during the service from the Episcopal Lectionary, an assigned list of Biblical text appropriate for that particular day in the liturgical calendar. Lay Readers also lead the congregation in reading/singing the Psalm for the day and also the Prayers of the People. Occasionally they lead Morning or Evening Prayer. Administering the chalice (the cup of wine during Communion) offers an opportunity to participate directly and assist in the celebration of Holy Eucharist, serving wine to those who come forward to the altar rail. Usually Lay Readers and Chalice Bearers wear white albs and join in processions. They are not obligated to do so; some choose to come directly from their pew to the lectern or altar when needed to serve. Greeters and ushers are usually the first people who welcome you to our community. They can help with seating and answer any questions about the service to support your worship experience. During the service, they collect the offering from the congregation, and help to identify members of the congregation to bring the gifts of bread and the wine to the altar for consecration before the celebration of the Eucharist. Eucharistic Visitors take communion to those who are unable to attend services at the church. Eucharistic visits are scheduled for the fourth Sunday of each month. Our EVs carry the parish with them as a sign of the whole community’s care, support, and concern for absent members. Find out about serving or how you can receive a visit.